Have a industry specific data and need high precision sentiment analysis? This is solution for you! Our web based sentiment training tool allows you to train custom sentiment model on your own data and achieve over 90% accuracy. 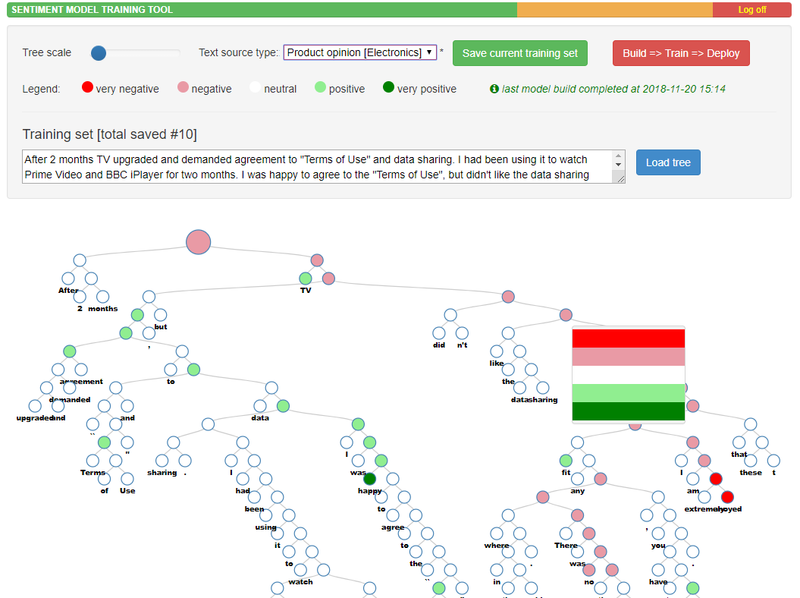 Simple tree visualization enables you to label sentiment values you think should be the most accurate. Thinking it is a lot of work? Don't worry, you don't have to start from scratch. Our training tool comes with our pre-trained generic model, so your don't have to spend too much time clicking. If you don't have resources, we can do it for you, please contact us for individual quote. The model training is performed using machine learning methods, including neural algorithms allowing self examination of the analysed results. Once you train your custom sentiment model, it will be automatically deployed to your training tool account as well, so each time you train, the better accuracy and less training will be required - same as with humans! Once finished, just click "Build-Train-Deploy" button. The next time you use our api (once trained and built), your new custom model will be used.